Whether it’s cracking your tooth on a hard piece of food or your child injuring their mouth in sports, a dental emergency can happen when you least expect it. Thankfully, Dr. Scott Parker is experienced in treating dental emergencies to get you out of pain and provide relief. He even offers early and late hours to accommodate morning and evening emergencies. At Scott Parker DDS, our office features a comfortable environment with state-of-the-art technology to deliver you the best emergency dental care possible. If you or a loved one is in pain, contact our office today. When dental disaster strikes, it’s crucial that you know what to do next. There are two different types of emergencies: physical injuries like broken or cracked teeth and infection that slowly develops from a poor oral healthcare routine. Having a knocked-out tooth can change your smile permanently and infections can lead to even more serious health issues. That’s why it’s important to know what to do in the event of some of the most common emergencies. If you experience pain in your tooth, try rinsing your mouth out with warm water and flossing. It could just be food debris that’s irritating your mouth. If pain persists, you could have a toothache that requires treatment. You may need a root canal to remove decay or infection to stop the pain. If you chip or break a tooth, visit our office right away. You should bring any pieces of your tooth that you can find, and you can also use a cold compress to numb the affected area and reduce swelling. If your tooth is too badly damaged or fractured, we may have to extract it to provide relief. When your tooth gets knocked out, it still has potential that it can be saved and replanted. Pick it up by the crown, carefully avoiding the tooth roots. Wash it off and try to place it back in your mouth. If this isn’t possible, store it in some water or milk until you can see Dr. Parker. The sooner you can get into our office, the better chances of successfully replanting your tooth. Losing a crown or filling can be incredibly painful because it exposes the sensitive area of your tooth that was once protected. To reduce pain, you can reattach your crown or filling with dental cement or adhesive. This will protect your tooth until you can come into our office to get treatment. Avoid using your teeth as tools or chewing on non-food items. Wear an oral appliance if you play contact sports or participate in physical activity. Avoid chewing on ice cubes, hard candy, or other foods that are meant to dissolve. Schedule biannual appointments with our office to ensure the health and safety of your smile year-round. It is difficult to estimate the cost of emergency treatment because of the many factors that influence what kind of treatment is necessary. Some simple cases may be fixed with at-home medication, while others require more extensive treatment. It all depends on which one of our services you may need. Another variable that can influence cost is your insurance. 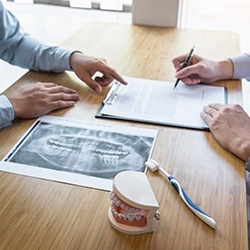 At Scott Parker DDS, we are proud to accept dental insurance, and we also provide low to no interest payment plans for those without it to provide affordable dental care.